Definition at line 626 of file monoTriangulation.cc. Definition at line 678 of file monoTriangulation.cc. Referenced by monoTriangulation2(), sampleBotLeftWithGridLinePost(), sampleBotRightWithGridLinePost(), sampleCompBot(), sampleCompTop(), sampleLeftOneGridStep(), sampleLeftOneGridStepNoMiddle(), sampleLeftSingleTrimEdgeRegion(), sampleRightOneGridStep(), sampleRightOneGridStepNoMiddle(), sampleRightSingleTrimEdgeRegion(), sampleTopLeftWithGridLinePost(), and sampleTopRightWithGridLinePost(). Definition at line 577 of file monoTriangulation.cc. Referenced by monoTriangulationOpt(), monoTriangulationRecGenOpt(), and sampleMonoPoly(). Definition at line 253 of file monoTriangulationBackend.cc. Definition at line 55 of file monoTriangulation.cc. 72 //we triangulate anyway, and print out error message. Referenced by sampleLeftOneGridStep(), and sampleRightOneGridStep(). Definition at line 929 of file monoTriangulation.cc. 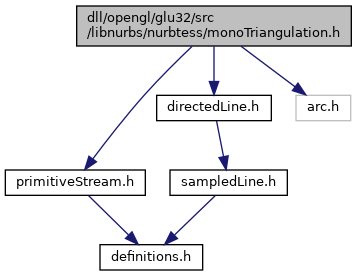 Referenced by monoTriangulation(), monoTriangulationRec(), and monoTriangulationRecOpt(). Definition at line 1033 of file monoTriangulation.cc. Definition at line 159 of file monoTriangulationBackend.cc. Referenced by monoTriangulationLoop(), monoTriangulationRec(), and sampleMonoPolyRec(). Definition at line 832 of file monoTriangulation.cc. Referenced by monoTriangulationFun(), and monoTriangulationRecFun(). Definition at line 303 of file monoTriangulationBackend.cc. Referenced by monoTriangulationFunBackend(), and monoTriangulationRecFunBackend(). Definition at line 734 of file monoTriangulation.cc. Referenced by monoTriangulationRecFunGen(), and monoTriangulationRecGenOpt(). Definition at line 492 of file monoTriangulation.cc. Referenced by monoTriangulationRecGen(), monoTriangulationRecGenOpt(), monoTriangulationRecOpt(), sampleCompBot(), sampleCompTop(), sampleLeftSingleTrimEdgeRegionGen(), and sampleRightSingleTrimEdgeRegionGen(). Definition at line 332 of file monoTriangulation.cc. 405 //we triangulate anyway, and print out error message. Referenced by sampleCompBotSimple(), sampleCompTopSimpleOpt(), sampleMonoPolyRec(), and sampleTopRightWithGridLinePost(). Definition at line 162 of file monoTriangulation.cc. Definition at line 104 of file monoTriangulation.cc. 119 //now both left and right have at least two vertices each. Definition at line 181 of file monoTriangulation.cc. Referenced by monoTriangulationRecGenTBOpt(), and triangulateConvexPolyVertical().